The following points are important lessons that my parents learnt in the first five years of my life when they tried to bring me up. 1) A king size water bed holds enough water to fill a house four inches deep. 2) If you pour kerosene on the leather cushion cover and light them with match sticks, they can ignite. 3) A 3-year-old's voice is louder than the priest's voice in a church. 4) Keep paintbrushes out of reach of children, if you want your television to remain in its original color. 6) Always have wooden windows. Never ever have glass windows. 7) When you hear the toilet flush and the words "hehehe", it's already too late. 8) Never ever insert a screw driver inside the electric-power socket. 10) When your three year old is playing with a small bean and if the bean can't be seen, chances are that the bean will be inside the nose or the ears of the child. 11) Chewing gums can also be swallowed. 12) If your child is less than two years of age and if he is not wearing his nappy, do mind your steps. If you don't,you might stamp on something sticky. The above picture was taken when Chronicwriter was ten months old (February 1983). He is not wearing an underwear in the picture. 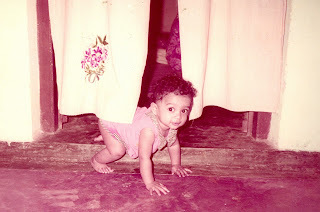 That was also the first time Chronicwriter graduated from crawling to walking. nutty u.. btw cute pic bro..
What a SUPER CUTE pic Chriz awwwwwww! **7) When you hear the toilet flush and the words "hehehe", it's already too late. LOL hahaha! I like this one the best! But here is a suggestion from me . I feel that you are narrowing down your ideas to kids and family mostly. I would like to see you write more about things happening around the world . I would seriously love to write about the big world. but seriously speaking, i dont know much to write about the big wide world..
this blog mainly revolves around renu, jeremy, jolena, my family, red underwear and my memories..
just the dose of humour I needed before I headed out for a disgusting exam. 2. Locking the self in and then screaming the heads off of the entire family can be a mere pastime, which often ends with angry glares and a gleeful laughter. 3. The kitchen can be a spot for treasure hunt. 4. Windows can be great hiding spots, as is the room between the four legs of a standard chair. Cute Picture. So you saw all your childhood fotos of you and your sis is it??? I do not believe one little bit that you are lazy. I also believe you are a very intelligent man who uses wit as a tool. Continue to make others laugh but yes when you do have time come up with other posts - if you wish that! Anything missing from the house can be found outside our balcony on the ground. can write humorous stuff about things that make news now around the Globe. But that i can make a decision based on who i am targeting..
marketing is a sea and i have just started swimming in it bro..
Memories came back rushing.. That's loads of mischief..
:P hahah ...nice pic bro :)..
Crizzy, u naughty naughty kiddo..
That comment was intended for a predecessor. lol. Just to say that all that appears in ths blog is not the end of your world. and yes it is just by way of information, not offence! Well u must ve kept your parents on your toes all the time as a child..
and u wer such a nut in ur family.. creating so many probs!!! with ref to the pic: WTF??! Where's the trademark Red Chaddi? 1)"Look!up in the sky!Is it a bird? Is it a plane?" Bad Guys: " Oh no! We're doomed! Either he's going to crack a joke or we'll get a sneak peek of his Red Underwear. 2) Mum:"Son, if you are not a good boy then Chronicwriter-man will come at night when you sleep!" 3) How does Chronicwriter-man battle recession? He uses only one pair of his trademark red undies. To save on washing costs he wears it over his pants. Superman has filed a copyright violation suit. Dude! No offence! All for a few laughs! I would love apost from you when you are a dad of one nutty 3 year old kid !!! :D You were really cute when you were a kid !! No one would have ever thought that cute sweet little boy got this much 'potential'. I'm sure my parents would have 'worshiped' me after reading this post. Awww...I love kids like that! hey...u were born a girl ??? Good post as always! Must keep these lessons for the near future. U are turning ur blog into an evening newspaper!! U actually did 5th??? U must have been a pain!!! Cute pic.. Is that really U?? thts such a sweet pic.... :) nice post. "5) You should not throw tennis balls up when the ceiling fan is on. When using the ceiling fan as a bat, you have to throw the ball up a few times before you get a hit. A ceiling fan can hit a tennis ball a long way"
-- MY PARENTS LEARNT THE SAME LESSON! HAH !! oops ! caps on by mistake. lol! !i always have a gala time on ur post yaar...just keep writing the same way...tat pic jus choo chweet.. Always smile, after your post. Good one. The baby luks like u!! !